Malala Yousafzai poses with a bouquet after speaking during a media conference at the Library of Birmingham, in Birmingham, England, Friday, Oct. 10, 2014, after she was named as winner of The Nobel Peace Prize. The Nobel Peace Prize 2014, is awarded jointly to Malala Yousafzai of Pakistan and Kailash Satyarthi of India, for risking their lives to fight for children’s rights. Malala was shot in the head by a Taliban gunman two-years ago in Pakistan for insisting that girls have the right to an education. BIRMINGHAM, ENGLAND (ASSOCIATED PRESS) — Malala Yousafzai celebrated her Nobel Peace Prize where she always wished to be: in school. 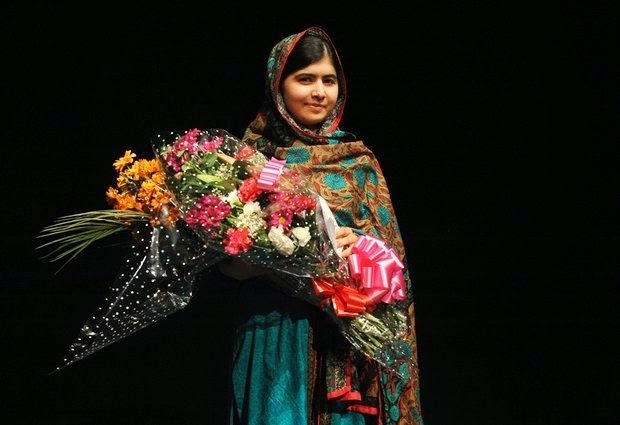 The 17-year-old Pakistani girl shot by the Taliban for daring to want an education learned she had become the youngest Nobel laureate ever Friday while attending classes at Edgbaston High School for girls in Birmingham, the city in central England that she now calls home. The teenager had traveled to Birmingham for medical treatment after being targeted by the Taliban for standing up to the group's hard-line interpretation of Islam that limits girls' access to education. She was shot while returning home from school in Pakistan's volatile Swat Valley two years ago, almost to the day. "This award is for all those children who are voiceless, whose voices need to be heard. I speak for them and I stand up with them," she said at a news conference Friday at Birmingham Library. "They have rights. They have the right to receive a quality education. They have the right not to suffer from child labor, not to suffer from child trafficking. They have the right to live a happy life." She said it was an honor to share the prize with Kailash Satyarthi of India, 60, who has spent a lifetime standing up against child slavery and exploitation. And she invited the prime ministers of their two rival nations, India and Pakistan, to attend the Nobel awards ceremony. Malala's case won worldwide recognition, and the teen became a symbol for the struggle for women's rights in Pakistan. In an indication of her reach, she spoke before the United Nations and made the shortlist for Time magazine's "Person of the Year" for 2012. But the journey was simply improbable. On Oct. 9, 2012, Malala, then 15, climbed into the back of a pick-up truck used to transport Swat Valley children home from school. They laughed and talked as the truck rumbled over roads lined with pot holes. As they approached a narrow bridge over a garbage-strewn stream, a masked man with a gun suddenly stopped the truck. Another man with a pistol jumped into the back. "Who is Malala?" he shouted. The girls did not answer but heads automatically swiveled toward her. The man raised his pistol. One bullet hit Malala on the top of her head. Two other students were also hit, less seriously. Malala was transferred to a military hospital near Islamabad, the Pakistani capital, as her head swelled dangerously. Her father, Ziauddin, was certain his daughter would not survive the night. He sent a message to his brother-in-law in Swat to prepare a coffin. Pakistani doctors removed a bullet that entered her head and traveled toward her spine before she was flown to Britain for more specialized brain trauma care. She woke up a week later at Queen Elizabeth Hospital in Birmingham. She says she regained consciousness with one thought: "Thank God I'm not dead." Malala gradually regained her sight and her voice. She was reunited with her parents. Soon there were pictures and stuffed animals at her side. She sent messages to well-wishers. Three months later she walked out of the hospital, smiling shyly as she cautiously strode down the corridor. "She is quite well and happy on returning home — as we all are," her father told The Associated Press at the time. Pakistan made Malala's father its education attache in Birmingham, giving the family stability and Malala a safe place to go to school. She went back to school as soon as she could, confessing that math was her least favorite subject. All the while, she campaigned for the rights of children to an education — meeting President Barack Obama, attending rights conferences, becoming the keynote speaker at corporate events in London. She began rubbing elbows with people who had the power and the money to help her realize her dreams. All along, she delighted many by simply being young, determined and most of all, herself. At a Vodafone conference celebrating women, she confided that she didn't have a cell phone. The crowd chuckled at the notion of a teenager who admitted she had no need for a phone. With British journalist Christina Lamb, she co-authored a memoir, "I am Malala," that made clear that she was, in fact, also a regular teenager. She loves the TV show "Ugly Betty," whose main character works at a fashion magazine. She likes pop star Justin Bieber, watches the television cooking show "MasterChef." And on Friday, the people who helped her on the journey — and those just touched by her story along the way — couldn't help but be swept up by the magic of it all. "Malala is an inspiration for the many women in Afghanistan and Pakistan who have been fighting for their rights and struggling against the misogynous policies of the Taliban and local warlords," said David Cortright, co-author of "Afghan Women Speak" and a professor at the University of Notre Dame in Indiana. "As we know, people learn best from personal stories. Malala's story is a powerful antidote to extremist propaganda, and the Nobel Prize reinforces its impact," he said. As news of her Nobel spread, doctors in Birmingham offered congratulations, noting her focus and dedication. And the people of the city that threw its arms out to welcome her simply nodded their heads. No surprise at this news. She's liked and well known in Birmingham, a city that Malala has embraced, proudly describing herself as a "Brummie," like other locals. "Sure, puts a bit of pride into it," said retired aluminum worker John Mullan, 78, of the news the city's adopted daughter had won a Nobel Prize. "She's just young girl who stood up to them. Many other people wouldn't have done that." Malala remains determined to return to Pakistan one day and enter politics. On Friday, her growing polish was clear. She spoke from the heart in three languages, offering an almost uncanny combination of a teenager with a vision and a diplomat with a platform. She did need a box, however, so that she could be seen over the podium. She will split a $1.1 million cash award with co-winner Satyarthi. Malala said the joint prize sends a message that the people of their rival nations — and Hindus and Muslims — can work together. "We support each other," she said. Then, standing alongside her parents and brothers, she posed for family photographs while the world's media begged them to look their way. Her normally reticent mother, who has more than once hidden when cameras emerged, stood alongside, beaming. What everyone wanted to know was: How did she learn the news? How did a schoolgirl who has just been pulled out of a chemistry class react upon hearing she had just received the world's most prestigious prize? "I felt really honored," she said. There was probably some jumping up and down, but she didn't mention that. Then, she said, she turned around and headed back to class. She was back in time for physics. Associated Press writer Kathy Gannon contributed reporting from Mingora, Pakistan.